GARNER, N.C. - Oct. 26, 2018 - PRLog -- The local Applebee's Neighborhood Grill & Bar at 5158 NC Highway 42 W. served up delicious burgers for a good cause Wednesday, October 17th, with all proceeds benefitting the West Johnston High School Band. 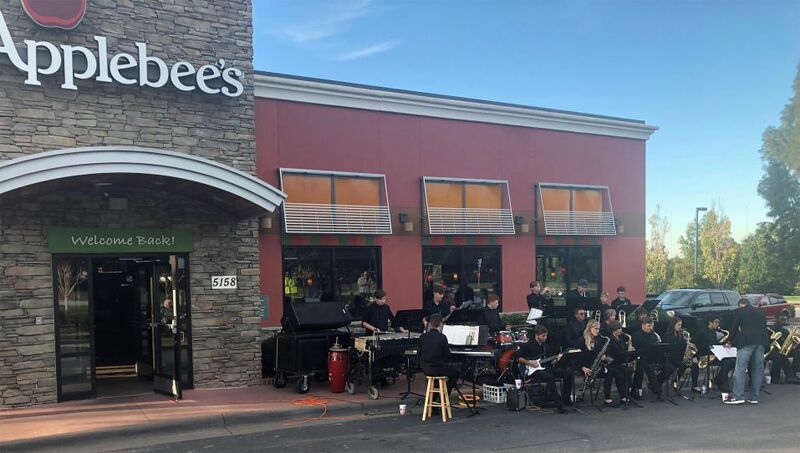 The restaurant's 'We Care Wednesday' event hosted guests that purchased tickets to enjoy a great meal and great music while supporting the school's organization. The jazz band even played outside of the restaurant for those that attended the event! This fundraiser contributed over $1,500 toward the general fund for the organization. "The We Care Wednesday event went very well." Said a representative from the West Johnston Band. They continued, stating "The staff at the restaurant at the Highway 42 location were very nice. Also thank you for letting our jazz band play." To learn more about the West Johnston Band, please visit https://www.westjohnstonband.com/-about-west. Applebee's is proud to partner with local nonprofit organizations as a way to raise money for their cause. 'We Care Wednesday' events can be held on Wednesday evenings from 4:00pm – 8:00pm. The nonprofit organization manages ticket sales and redemption while the Applebee's team handles the rest! Tickets sell for $10 and feature the selection of a hamburger, cheeseburger, or bacon cheeseburger with fries and a fountain drink or iced tea. Applebee's provides the organization with great food and service, while only charging food costs for tickets redeemed. The Applebee's 'We Care Wednesday' program represents one of the company's efforts to remain active within its local neighborhood. To request a 'We Care Wednesday' event, please visit AGGrestaurants.com. The Apple Gold Group, one of the original five Applebee's Franchisees, was founded in 1984 to develop and operate Applebee's restaurants in North Carolina, opening its first Neighborhood Grill and Bar in North Carolina in 1985. Three decades later, the company currently owns and operates locations in North Carolina and South Carolina. The Apple Gold Group strives to be a recognized leader in both the casual dining industry and in local charitable fundraising. For more information on the Apple Gold Group, please visit www.AGGrestaurants.com.